An SEO project plan is a document that defines the tasks and resources that will be used to create, operate, manage a SEO marketing program. An SEO project plan can include objectives, implantation options, site assessment, competitive analysis, project tasks, and tracking systems. SEO Program Research - SEO program development can start with research which gathers reference (SEO fundamentals) along with other business and time sensitive data that can be used to help plan, setup, and run SEO programs. The SEO research phase may discover or obtain performance benchmark levels for your industry (traffic, conversion rates). Best to read 3 to 5 books to get a balanced perspective. 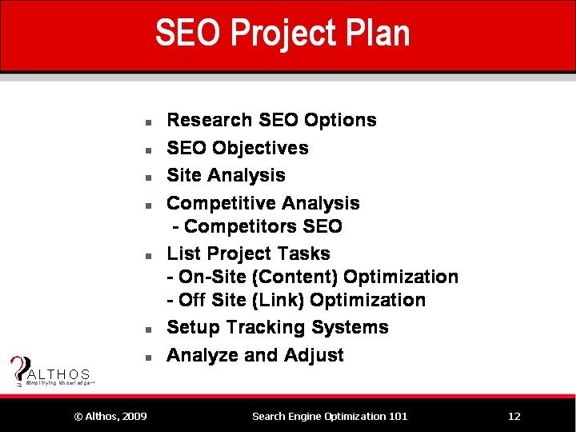 Examples; SEO Marketing- Althos, SEO Bible, Search Engine Marketing, Inc. It is also good to attend seminars or participate in online inudstry groups to develop a network of support buddies. Project Objectives (Goals) - Project objectives are statements that identify targets that should be achieved through project tasks. SEO program objectives may include increased traffic, increased percentage of qualified visitors, increased sales, increased average order, and reduced page bounce rate. Site Assessment - An SEO site assessment is a review of existing web sites for content (text, images), navigation (link hierarchy), syntax, media formats, and other SEO related attributes for a web site to determine key areas for SEO improvements. The may include the current use (or lack of use) of style sheets, metadata, site maps, and robots.txt. A keyword analysis may be performed to determine which keywords are used, keyword density levels, keyword positioning and keyword emphasis. A link portfolio will be identified (in and outbound links) along with determining which directories (such as Yahoo, DMOZ) contain site links. A SPAM review may be performed to determine intentional or unintentional SPAM components such as hidden content, tiny links, doorway pages, and duplicate content check. The SPAM review may be essential if a previous SEO company was used which did use approved SEO tactics. Competitive Analysis - Competitive analysis is the identification of key competitive components, the researching of these components in relation to competing companies, and the analysis of this information to determine strengths and weaknesses of competitors. Competitive analysis may range from a simple review of the content and features offered by competitors to the use of SEO spy tools to determine how (and if) competitors are performing search marketing processes. On-Site Project Tasks - On-site SEO project tasks adapt the web site content and functions to be SEO friendly. These tasks may include gathering content, SEO copywriting, page structuring (layout and header hierarchy), keyword positioning, and other actions that can be directly controlled by the web site owner. Off-Site Project Tasks - Off-site SEO project tasks involve working with other companies to develop web relationships (such as link building) that can help SEO. These tasks may include link building, sponsoring social network sites (such as user groups), participating in industry blogs, and submitting listings to industry directories. SEO Measurement and Tracking - SEO measurements and tracking reports should be setup to provide a regular source of information that allows for the verification of SEO performance. Analysis and Adjustment - SEO analysis and adjustment is the review, evaluation, and project plan updates and changes that can improve SEO performance. SEO is a continuous process as external events (such as changes in competitor tactics and evolving social networks) can decrease the SEO performance.